Dubai's education system from nursery or kindergarten to university is varied and offers a massive choice to expats. Where on earth do you start? We have enlisted the help of The Blossom Nursery to guide you. If you would like to share your Dubai nursery school experience please contact us. Nursery schools in Dubai are licensed through the Dubai Economic Department (+971 4 445 5555) and regulated through the Ministry of Social Affairs (+971 4 263 7777). Nursery schools must also abide by the rules and regulations as set out by Dubai Municipality – Department of Health and Public Safety (local number 800 900). Regular inspections are carried out by the Ministry of Social Affairs. There are many nursery schools in Dubai and various curricula. Where do you start? Check that the nursery school is on the Ministry of Social Affairs Nursery Schools list and that its license hasn’t expired. 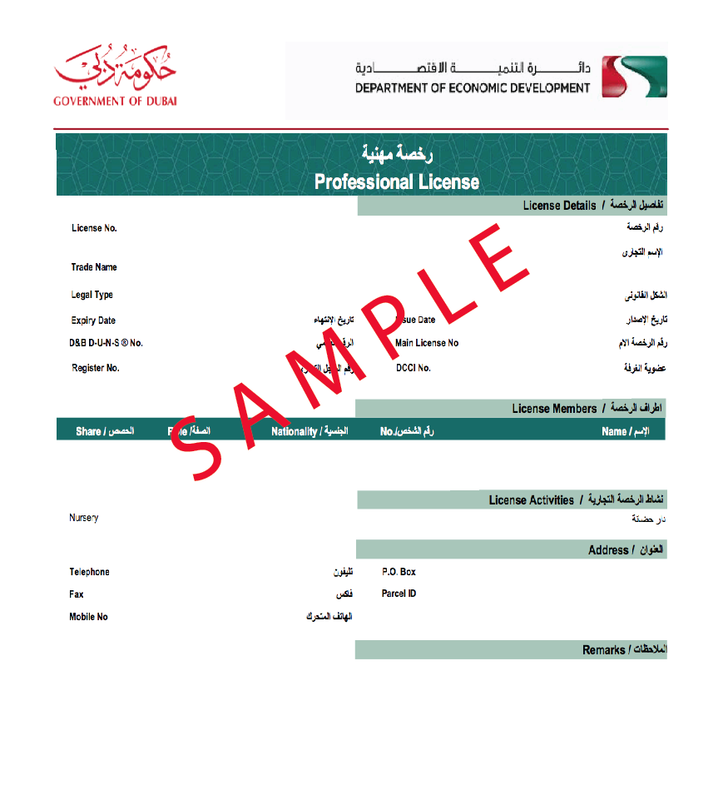 You can ask the nursery school staff for a copy of their license which would be issued by the Dubai Economic Department. You should also ensure that insurance is in place. Which curriculum better suits your child? Does the curriculum matter to you? What do I look for in a nursery school? Paying the nursery school fees? Tips from the early education experts at The Blossom Nursery. Before doing anything or going anywhere it’s best to be armed with a bit of background knowledge about the Ministry of Social Affairs, the Dubai Economic Department and nursery schools in Dubai. That way, you can make an informed decision as to which nursery schools to visit and why. Asking the right questions is just the beginning. Along with the help of The Blossom Nursery we’ve listed some questions below which may help. Remember that you will be speaking to a lot of different people from different nationalities and backgrounds so try to word your questions in an easy to understand manner. Remember to take notes – it’s easy to forget when you’re collecting a lot of information. The license can be checked at the Dubai Economic Department website via this link. All you need to enter is part of the name of the nursery, e.g. 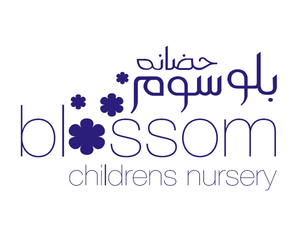 Blossom in the case of The Blossom Nursery, don’t worry about adding the Arabic or the Activity. Then type in the ‘captcha’ number and hit the search button. The database will generate companies with the word ‘Blossom’ in it. If you can’t see it you can try checking through the License Number if you have the company license. 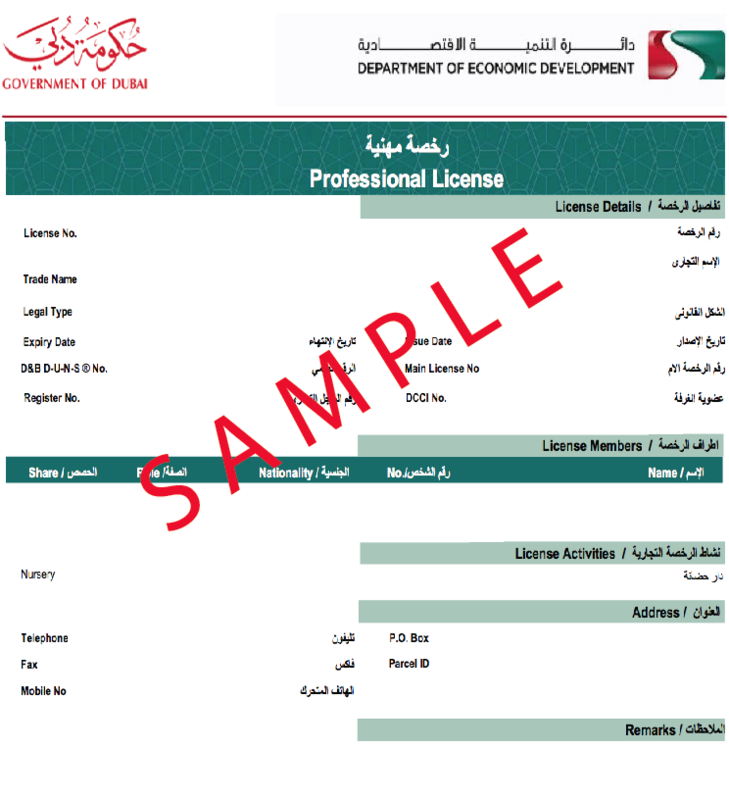 If you can’t see the license information please phone the Dubai Economic Department and ask them to check it for you. There is no excuse for not having a license. It is a legal requirement. Do not accept any excuse, just a copy of the license. Your child’s safety is of paramount importance. As with most businesses, liability insurance should be in place in case anything were to happen on site. The Blossom Nursery keeps a detailed record of any accidents, fevers or any other aspect of the nursery day and its children. The parent should be informed on the same day. This is best practice. Ensure the nursery you visit has a similar system in place. You have every right to ask for a copy of the insurance certificate. Which Curriculum better suits your Child? This is something we rarely take into consideration in Europe as mainstream education takes a very high percentage of the system and is governed by the local authorities. There are different curricula, e.g. Montessori and other alternatives are available. In Dubai you need to consider this aspect and decide what you feel is best for your child. If you are returning to your home country in a few years, then you should take your home country’s education system into consideration and hopefully their will be an easy overlap for your child. For very young children the curriculum is unlikely to be of any great consequence. At all times the safety, security and happiness as well as the education of your child is of utmost importance so focus on these aspects when visiting a nursery. The Montessori approach focuses on independence, freedom within limits and the respect for a child’s natural psychological, physical, and social development. 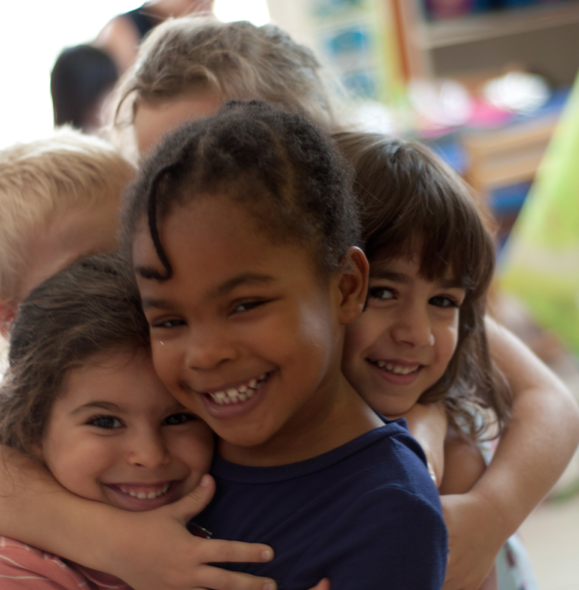 Often Montessori nurseries will combine larger age ranges so children learn from each other. This educational approach allows each child to develop at their own rate, pace and take the lead in their own development. Reggio Emelia places a greater focus on the principles of sensory learning, respect, responsibility and community. This is learned through exploration and discovery in a supportive and enriching environment based on the interests of the children through a self-guided curriculum. The British EYFS curriculum is the mandate for learning and development in the UK. It is based on prime and specific goals for children. Each prime and specific goal has areas where the children will learn, develop and grow and their progress is documented as emerging, expected or exceeding. Generally, if you choose a nursery with strong educational planning, your little one will be able to transition easily into big school. Just make sure there is strong planning every day and that the nursery gives you evidence of learning. See the What to Look for in a Nursery section for details. What is the daily schedule for your child’s class? What evidence of learning is shared with parents? How often? Are teachers confident in applying the nursery curriculum to learning? Are staff members trained in education? Are they required to complete additional annual training hours? Are extra activities included to extend the learning beyond the classroom? For example, music, languages, ICT, fitness, outdoor play, indoor play, art, cooking etc. Is there an accredited program for FS1 and FS2? What do I look for in a nursery? The best advice given by The Blossom Nursery is to ask a lot of questions and trust your instincts. You are trusting the nursery and staff to keep your child safe and secure while they are not in your care. This is your No 1 priority as your child will be spending much of their day in the nursery. What is the ratio of staff to children in the classroom? Is there an open door policy for parents? Are CCTV cameras installed in each classroom? If there are, who has access to these recordings? How long are the recordings retained? What are the safeguarding policies for children: allergies, health policies, cleanliness of nursery, cleaning materials used, risk assessment etc? If the parent cannot collect the child what are the security arrangements for A N Other to visit the nursery and collect the child. How many staff members are Paediatric First Aid and CPR trained? How often are these certificates renewed? Is there a food program? What are the policies on allergies? Have any of the doors been left open? Have any of the gates been left open? How easy is it to access the nursery unnoticed? Do the classrooms and other areas appear clean? Check the toilets. Are any windows open where a child could climb out of? Are there any dangerous items available without supervision, e.g. scissors? Are the children happy and engaged? Does the nursery have an open door policy – how secure is the nursery in general? Are the staff interacting with the children in a focused manner? Are the staff happy and approachable? Do the children approach them with a smile? Are there various areas for children to explore and learn through play? For example, libraries, water play areas, art zones, tech stations, green outdoor space etc. If your child is with you on the tour, does he/she seem interested and engaged? Does the teacher interact with you and your child? Do you feel comfortable? You need to feel that your child is in the best hands and if you feel confident, your child will too. The Blossom Nursery website has a more detailed list of suggested questions to ask prospective nurseries. It covers everything from safety to health, curriculum and play. are there nursery schools close to your home or work, e.g. would you be happy if your child needed to travel for 20-30 minutes each way, each day? how will you take your child to nursery school – will you drive, will your driver take your child or will you use the nursery school bus service? Some bus services do not accept children under the age of 2 year. Parents provide their own car seats. School bus attendants should have a dedicated mobile phone on their person at all times during their working hours. is there a nursery school bus service which you would use? Would you be happy to leave your child in a school bus under supervision? For example, The Blossom Nursery maintains a list of children on the bus which is updated constantly – every time children are taken off the bus the attendant has a checklist to ensure all children are off the bus and in the class. We will be adding a section on school bus services to the DubaiSurvivalGuide website shortly. All children attending nursery and, in fact any educational establishment, need to provide a copy of their passport, birth certificate and visa. The birth certificate will need to be stamped and attested in the country of origin by the UAE Embassy and then in Dubai it should be stamped and attested by the Dubai Ministry of Foreign Affairs. As long as the parent has a visit visa stamped on their passport, then it is usual for a nursery to allow a term to organise their full visa from their employer to be stamped on their passport. The employer should provide a letter stating that the employee’s visa is in progress. After the employment and residency visa is stamped on the employee’s passport then the visa for the dependents can be organised. This part of the procedure should only takes a few working days at most. In most nurseries, post-dated cheques are required upon registration and payments are taken every term which is approximately every 3 months. You should double check this aspect of the nursery school when visiting and ensure that there are no hidden charges. As always, read the small print. All parents quickly learn that bedtime routines are among the most important since children need at least 10 to 13 hours of sleep each night, so be sure they get enough rest especially before first day. Bring your child to class in time for the morning routine. This way they know what to expect and also have time to settle in before their busy day starts. Although teachers try their best to make sure children’s paint stays on the paper and food goes into their mouths, spills happen so make sure the clothes your child is wearing can withstand spills once in a while. Leave a few changes of clothes at nursery and make sure you label everything (clothes, shoes, bottles, bags, hats and toys). and the most important tip of all – trust the Teacher! Children will pick up on your energy so if you are trusting and enthusiastic your child will be too. Talk about your child’s teacher at home and visit their class before school starts so they are familiar with their surroundings and can spend some time with their new friends. It can be hard to leave an upset child when you say good bye for the day, but trust us it is better not to linger in the classroom. Allow the teachers this time to bond with your children and settle them down if they are upset. If the nursery has CCTV cameras you can watch the screen to see how your child is doing. Like any new experience, the first days at nursery can cause some anxiety for children and parents. Here are top tips from a teacher who has been with The Blossom Nursery for 3 years and is an expert at making this transition exciting and stress free for parents, children and teachers! Give your child’s teacher information about your little one’s preferences, dislikes, fears and home routine. Of course teachers will get to know your child’s needs and preferences but in the beginning it’s important to give them as much information as you can to ease the transition from home to nursery. If you do not speak English at home, let the teacher know important words in your child’s vocabulary so they are comfortable communicating with the teacher. Check the nursery’s policies to ensure staff are trained in safeguarding, pediatric first aid and emergency preparedness. It is especially important if your child has an allergy to make sure the nursery is aware of this and has a strict policy in place to prevent and respond to an allergic reaction. Let the teacher know if your child has any fears or concerns. For example, if they are afraid of water teachers will take extra care during water play or swimming to make the child feel comfortable and eventually build their confidence enough to overcome their fear. While potty training, some children are afraid to use the toilet. Telling the teacher about this will help in the potty training process as they will communicate progress to you and can also give you some helpful tips. Basic information about your home routine is very helpful for teachers and makes your child feel more comfortable. Can your child eat on their own? Do they use the toilet at home? Do they know how to share? Does your child have a favorite stuffed animal or blanket? Some teachers find that for the first week a child is at nursery, it helps them feel safe if they have something from home. This can be a stuffed animal, special blanket or even pictures of mummy and daddy. As children get more comfortable they will not need to bring it anymore, but it can be a help in the beginning. Some nurseries accept babies from 6 weeks, others wait until the child is 6 months to ensure that full vaccination has been undertaken. Check out the Dubai Knowledge & Human Development Authority. This is an interesting website with details regarding the education system in Dubai. There is a little information regarding early education. Currently, KHDA is not involved in inspecting any nursery schools. We are waiting for an updated list of all registered nursery schools in Dubai – we’ll add it to this section as soon as possible. Don’t leave anything to chance so ask as many questions as you like and always view the facilities before deciding on a nursery. Nursery school staff will know that this is a daunting experience – everything’s new: country, home, schools, friends just for starters.